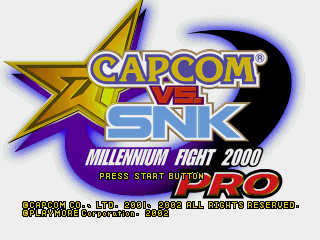 Capcom Vs. SNK was released in the year 2000. 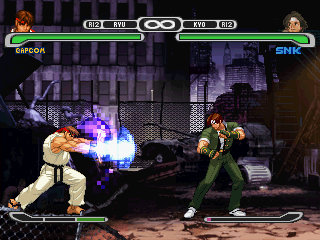 Whilst no Final Fight characters are playable in the game, there is a related stage. This background is set at night in a street, with a building on the right which has a lot of graffiti on it. You can unlock the Slum Alleyway track from the original Final Fight to play on this stage. This stage is in Capcom Vs. SNK and the updated version, Capcom Vs. SNK Pro. 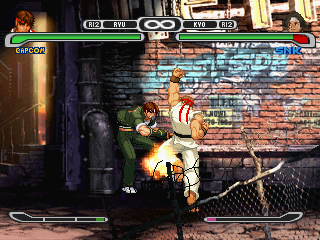 The original Capcom Vs. SNK was released for the arcades and Dreamcast. The Pro version was also released for those formats along with a Playstation port, which these screens are from.